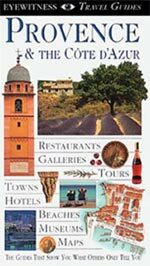 Filled with over 250 pages, this unique guide gives great detail about Provence and the Côte d'Azur. The main body of the guide is broken up into sections that detail the sights and attractions of five unique regions. The attractions are then organized by the individual towns in which they are located. The greatest quality of this guide is the detailed maps and city plans contained within. These carefully drawn maps and plans are easy to read and easy to follow. The book's most splendid feature is the cutaways and floorplans of many museums and landmarks. These cutaways allow readers to get a glimpse of how the interiors of certain buildings are laid out. The guide is also full of hundreds of photographs of landmarks and the region’s countryside. There is also a wonderful section dealing with where visitors can find accommodations, dining, shopping, and entertainment. At the back of the book is a very helpful section with useful information about traveling around Provence and France. "A new breed of Guidbook." "The most graphically exciting and visually pleasing series on the market."